Sometimes, ya just need a thick pint of Guinness. This classic foamy brew just goes down so nicely with the right edible accompaniment. Say, what are the best foods to eat with a pint of bitter, anyway? Obviously, this matter is always up for debate but based on our experience, the pairings you see below are practically matches made in heaven. Plus, you can find all of these items on our menu! These lightly dusted, jumbo wings are prepared with your choice of sriracha lime, maple and cracked pepper, honey garlic, house BBQ, or hot sauce. 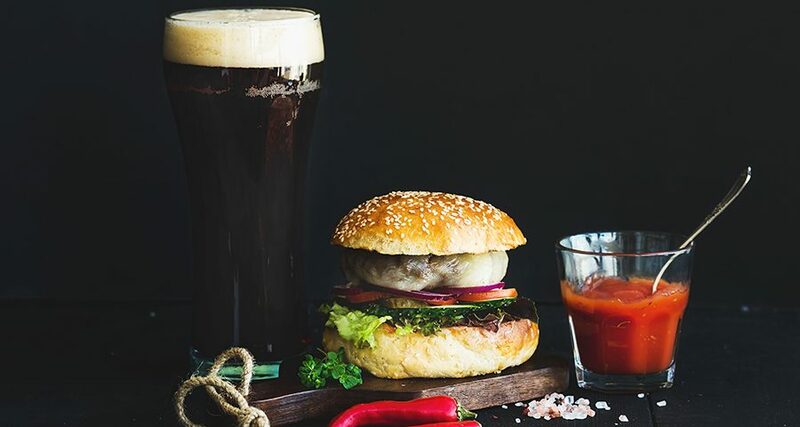 No matter which sauce you pick, a hefty glass of Guinness is sure to neutralize your palate. This shareable snack is about as crispy as it gets. It’s built from the ground up with waffle-cut potatoes, beer-braised beef, caramelized onion, and fresh cheese curds. Meaty and dressed up with a touch of sweetness, the sharp flavor of Guinness is sure to accentuate your plate of Irish Nachos. If you fancied our Irish Nachos, you’ll probably love this sammie just the same. It’s made with the same mouth-watering caramelized onion, beer-braised beef, and crisp-fried potatoes as our adored appetizer. Hence, you don’t have to ask us why the two are made for each other. This guy has personality. You’ll find him decked out in jalapeno chutney, Swiss, mozzarella, white and American cheddar, crisp onion rings, and garlic aioli. Take a break from all that spice with a swig of creamy Guinness. We don’t think it gets any more British than this! Comprised of locally produced bangers, herb-mashed potatoes, topped with caramelized onion, and Jameson gravy, these two make a truly filling pair. Sit down with some friends and watch the game with Guinness and fish and chips. Battered just right and served with our hand-cut fries, house-made coleslaw, and caper dill tartar, you’re in for a rockin’ meal. Having a bowl of our rich and satisfying lamb stew is a great way to wrap up a Sunday afternoon. In fact, it’s also already stewed with Guinness! Might as well have more while you’re at it, eh? Cottage pie is one of the friendliest little dishes you could ever have. Earthy by nature and containing a balanced amount of veggies, ground chuck, cheddar mashed potatoes, and herb topping, Guinness once again pleasantly supplements this meal with its creamy and distinctive flavour. We’re not sure if you noticed but Guinness is one of our favourite brews. Its warm, foamy deliciousness makes it great to have with so many different foods. Even Guinness itself recognizes how compatible it is with different meals. If you’re craving a pint and are looking for ideas, check out their website or come visit us at the Thompson House. We promise you won’t be disappointed. Guinness in the fall with that homemade Thompson Cottage pie! Can’t go wrong, looking forward to it.